From July 2018, the generic RJC logo will now be issued to RJC certified members only. With immediate effect, the RJC logo will no longer be issued to new and non-certified members until they have achieved certification against the RJC Code of Practices. I am a RJC member. Which logos can I use? Please refer to the section below that is most relevant to your RJC status for more information. 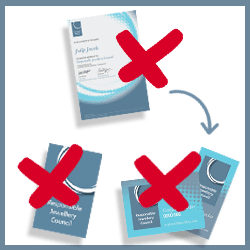 RJC members who have not yet achieved certification against the RJC Code of Practices may not use the generic or RJC certification logos. If you are currently using the RJC logo on your website and any other marketing collateral, please remove it with immediate effect. You can continue to evidence your membership of the RJC via your unique profile page on the RJC website. If you are not sure where to find this, please click here to get in touch with the RJC’s Membership department. When you are audited and certified, you will be issued with your unique certified member logo as well as the generic logo. If you have achieved certification against the RJC Code of Practices, you will be able to use both the generic RJC logo and your unique RJC certification logos. If you are an existing member and currently using one or both of these logos on your website and marketing collateral, you do not need to take any action and can continue to use these logos as normal. 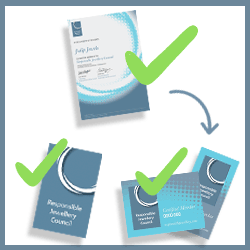 Certified members can use the generic RJC logo, certification logos and their unique profile page on the RJC website as evidence of their RJC membership and certification. Since Trade Association members are not required to achieve certification against the RJC Code of Practices, these members can use the generic RJC logo on their website and marketing collateral. 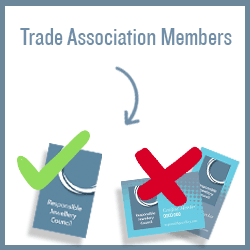 Trade Association members are not allowed to use any certification logos on their website or any marketing collateral. Have any questions or enquiries about logo usage? Please click here to contact the RJC with your logo usage enquiry.